(i) The given figure has its rotational symmetry as 4. (ii) The given figure has its rotational symmetry as 3. (iii) The given figure has its rotational symmetry as 3. (iv) The given figure has its rotational symmetry as 4. (v) The given figure has its rotational symmetry as 2. 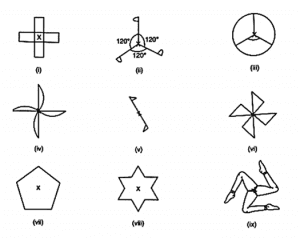 (vi) The given figure has its rotational symmetry as 4. (vii) The given figure has its rotational symmetry as 5. (viii) The given figure has its rotational symmetry as 6. (ix) The given figure has its rotational symmetry as 3. 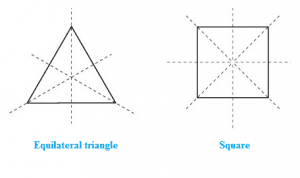 An equilateral triangle and a square have both lines of symmetry and rotational symmetry. Give an example of a figure that has a line of symmetry but does not have rotational symmetry. A semicircle and an isosceles triangle have a line of symmetry but do not have rotational symmetry. Give an example of a geometrical figure which has neither a line of symmetry nor a rotational symmetry. 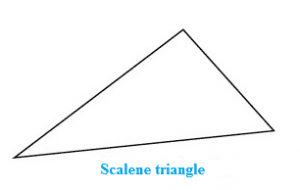 A scalene triangle has neither a line of symmetry nor a rotational symmetry. (ii) Rotational symmetry of order 2. (i) The letter of the English alphabet which has no line of symmetry is Z. (ii) The letter of the English alphabet which has rotational symmetry of order 2 is N.
What is the line of symmetry of a semi-circle? Does it have rotational symmetry? A semicircle (half of a circle) has only one line of symmetry. In the figure, there is one line of symmetry. 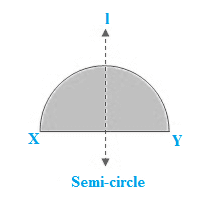 The figure is symmetric along the perpendicular bisector I of the diameter XY. A semi-circle does not have any rotational symmetry. 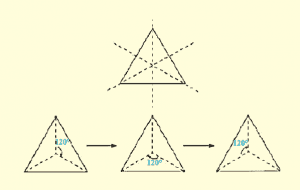 (i) a triangle with both line and rotational symmetries. 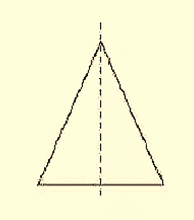 (ii) a triangle with only line symmetry and no rotational symmetry. (iii) a quadrilateral with a rotational symmetry but not a line of symmetry. (iv) a quadrilateral with line symmetry but not a rotational symmetry. (i) An equilateral triangle has 3 lines of symmetry and a rotational symmetry of order 3. 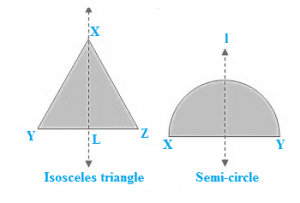 (ii) An isosceles triangle has only 1 line of symmetry and no rotational symmetry. (iii) A parallelogram is a quadrilateral which has no line of symmetry but a rotational symmetry of order 2. (iv) A kite is a quadrilateral which has only one line of symmetry and no rotational symmetry. Point of intersection of the line segments joining the mid-points of opposite sides.